An assistant prosecutor who became a de facto part of a murder victim’s family by navigating through a grueling trial and securing a conviction and a 70-year prison sentence for a Union Township man who brutally killed and dismembered his girlfriend. 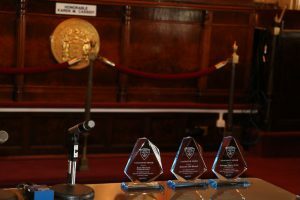 A universally beloved veteran detective who makes going above and beyond the call of duty a matter of routine in attending to the needs of Union County’s most vulnerable crime victims. A victim/witness advocate who handles some of the most sensitive matters imaginable – to include aiding young victims of crime who experienced torture-like abuse, and connecting survivors to the social services they need while they relocate across the country. These three – Scott Peterson, Ted Merced, and Azucena “Susie” Arias, respectively – are the Union County Prosecutor’s Office staff members honored Monday during a ceremony held in the historic Union County Courthouse Tower as part of the Office’s recognition of National Crime Victims’ Rights Week, going on this week with many other events being held nationwide. The theme for this year’s Week, annually designated by the federal government since the early 1980s, is “Expand the Circle: Reach All Victims,” emphasizing the importance of ensuring that all victims are strengthened by the response they receive through a diversification of critical services. 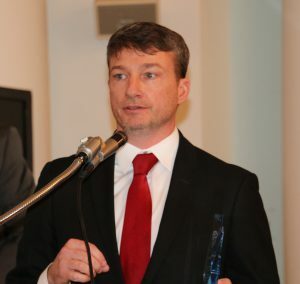 Peterson, recipient of the Gladiator Award for an Assistant Prosecutor, has served in the Office’s Special Victims Unit since October 2016, following a five-year stint in the Homicide Task Force. One of the homicide cases he retained responsibility for even after the transfer was State v. Matthew Ballister III, a defendant who in December 2017 was sentenced to 70 years in state prison for the murder of his girlfriend, 43-year-old April Wyckoff of Cranford. A joint investigation involving the Union County Homicide Task Force, Union Police Department, and Union County Sheriff’s Office resulted in Ballister being arrested and charged with murder on Thursday, October 24, 2013 – two days after Wyckoff had died at his hands. Three days after the arrest, following an intensive search involving more than 200 municipal, county, and state law-enforcement representatives combing through multiple areas in Essex, Hudson, and Union counties, human remains were recovered on Raymond Avenue near the Pulaski Skyway in Newark and positively identified as belonging to Wyckoff. The rest of her body was never found. During the years that followed, Peterson kept in constant contact with Wyckoff’s family, and in the process, formed a tight-knit bond with them. In the autumn of 2017, they together reflected on her life after a six-week trial resulted in convictions on all charges against Ballister. Fellow Office nominees for the Gladiator Award for an Assistant Prosecutor included Cynthia Ritter, Susan Gleason, and Nicole Siano. 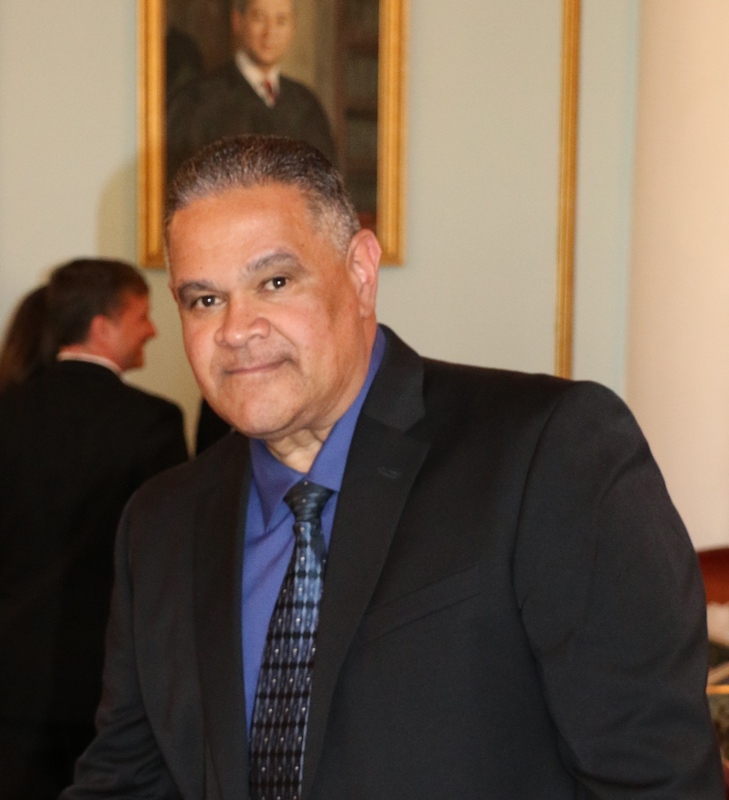 Merced, recipient of the Gladiator Award for an Investigator, was honored for more than a decade of dedicated service in the Prosecutor’s Office’s Domestic Violence Unit, which he joined in 2007 after initially being sworn in as an Office Detective in 2001. Merced’s responsibilities in his official capacity include investigating incidents of domestic violence, testifying before the Grand Jury, taking statements from victims and witnesses, writing investigative reports, serving subpoenas, and more. He also routinely assists the Homicide Task Force, Special Prosecutions Unit, Narcotics Strike Force, Trial Unit, Special Victims Unit, and Juvenile Unit, among others, with Spanish-language translation of statements. But what Merced is known for best – aside from his ever-present smile – is a remarkable ability to connect with even the most reluctant of victims by making them feel at ease throughout the criminal justice process. It’s an invaluable trait for a detective to have, especially in a Unit that often sees cases that are unable to be adjudicated because victims ultimately decline to participate. Fellow Office nominees for the Gladiator Award for an Investigator included Sgt. Sofia Santos, Lt. Joe Vendas, and Detective Brian O’Malley. 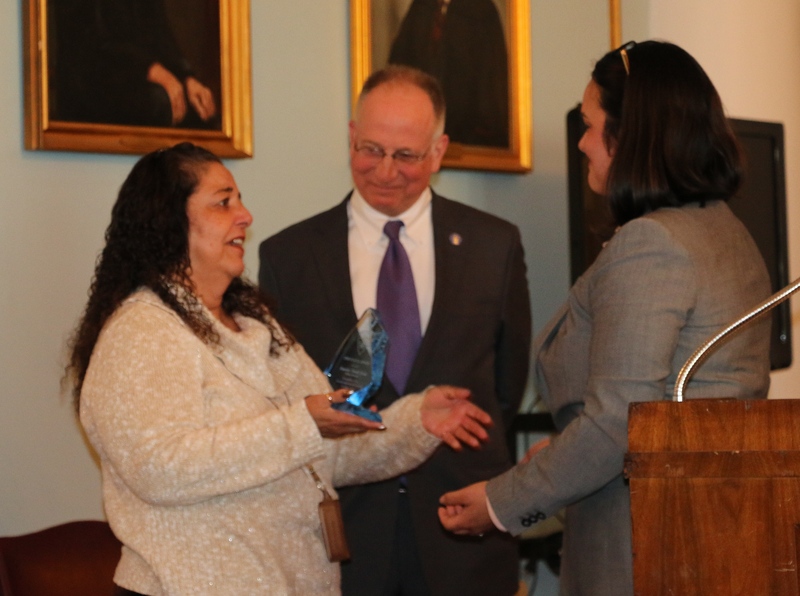 Arias, recipient of the Endurance Award, has served as a victim/witness advocate in the Office’s Domestic Violence Unit for the last five years. Her responsibilities there include reviewing and providing orientation of cases for victims and witnesses. While that is a brief description of her efforts, it could mean just about anything – from providing emotional support to a victim, to ensuring access to safe waiting areas, to simply making sure that a witness has enough bus fare to get to and from court. “Susie,” as she is known in the Office, was recognized for her ability to consistently lead victims from a feeling of powerlessness to a sense of empowerment, no matter how long the road. Fellow nominees for the Endurance Award included Stephanie Villavicencio, Maria Esteves, Kimberly Best-Parris, Rosalina Cerda-Lopez, and Maria Acosta. For more information about National Crime Victims’ Rights Week, go online to https://ovc.ncjrs.gov/ncvrw/.